Louisville, KY – March 27, 2019 – Charah Solutions, Inc. (NYSE: CHRA) (“Charah Solutions” or the “Company”), a leading provider of environmental and maintenance services to the power generation industry, today announced financial results for its fourth quarter and full year ended December 31, 2018. Net income attributable to Charah Solutions for the fourth quarter of 2018 was $4.5 million, or $0.15 per diluted share. Adjusted net income and Adjusted earnings per diluted share1 were $5.4 million and $0.18, respectively, and Adjusted EBITDA was $22.9 million, up 12% from the year-ago period. For the full year 2018, net loss attributable to Charah Solutions was $(8.9) million, or $(0.33) per diluted share, including significant non-operational and non-recurring charges. Excluding these charges, for the full year 2018, Adjusted net income and Adjusted earnings per diluted share were $24.5 million and $0.92, respectively, and Adjusted EBITDA was $98.8 million, up 30% from 2017. 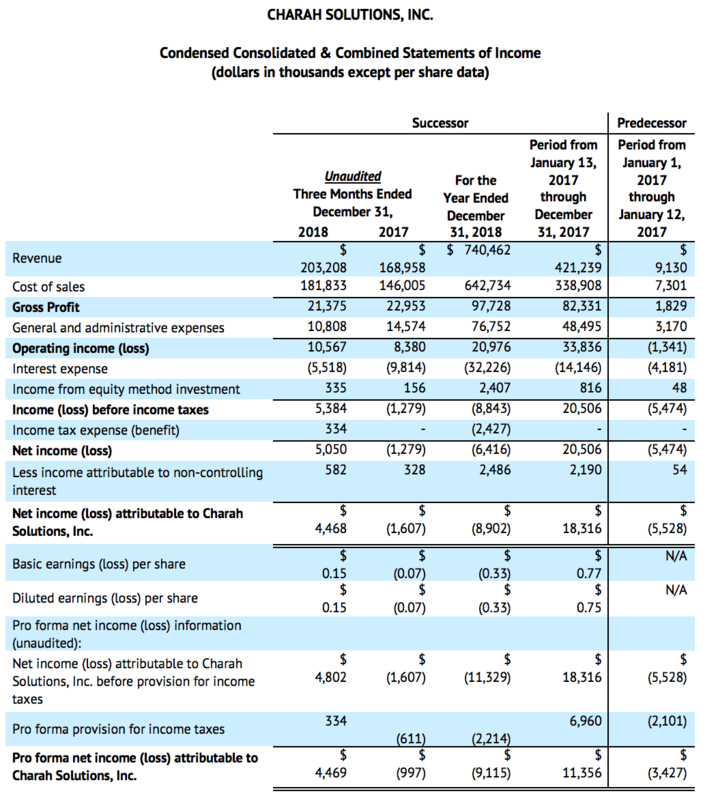 1 Adjusted net income, Adjusted earnings per diluted share and Adjusted EBITDA are non-GAAP financial measures and the reconciliation of each of these to the most comparable GAAP measure is included in the financial tables accompanying this release. Revenue for the fourth quarter of 2018 was $203.2 million, an increase of $34.3 million, or 20%, from $169.0 million in the fourth quarter of 2017. Gross profit decreased $1.6 million, or 7%, to $21.4 million from $23.0 million in the fourth quarter of 2017. 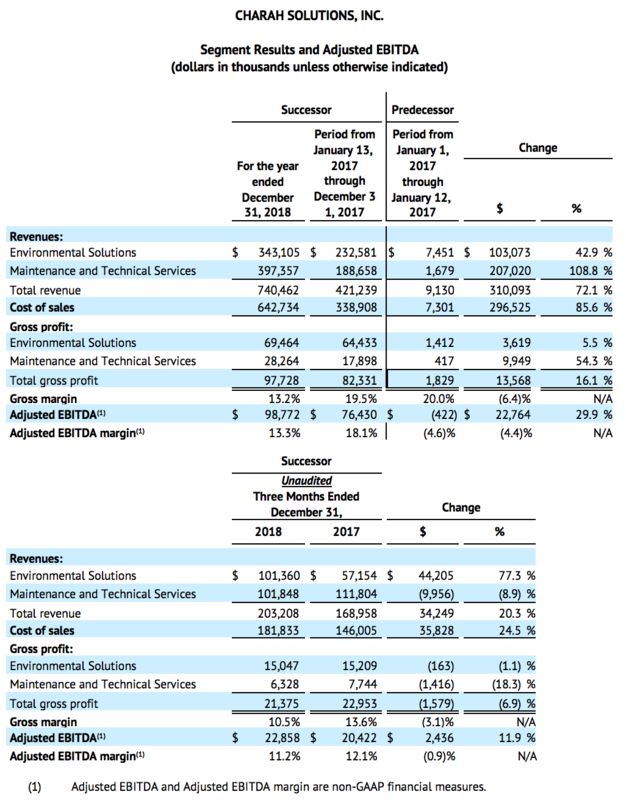 Gross profit as a percentage of revenue, or gross margin, declined to 10.5% from 13.6% a year ago, primarily due to lower gross margin in the Company’s Environmental Solutions segment. Environmental Solutions Segment: Environmental Solutions generated revenue of $101.4 million, an increase of $44.2 million, or 77%, from the fourth quarter of 2017, primarily due to the accelerated completion of the Brickhaven contract and the acquisition of SCB in March 2018. Gross profit of $15.0 million was slightly lower than the $15.2 million in the fourth quarter of 2017, primarily due to adverse weather-related impacts on certain remediation projects. Gross margin declined to 14.8% from 26.6% in the fourth quarter of 2017 primarily due to the mix of contracts and unusually adverse weather. Maintenance and Technical Services Segment: Maintenance and Technical Services generated revenue of $101.8 million, a decrease of $10.0 million, or 9%, from the fourth quarter of 2017. The decrease was primarily attributable to lower revenues in the Company’s nuclear services business, which resulted from shorter outages of reduced scope relative to the year-ago period. Gross profit decreased $1.4 million, or 18%, to $6.3 million from $7.7 million in the fourth quarter of 2017. Gross margin declined to 6.2% from 6.9% in the fourth quarter of 2017. Net income attributable to Charah Solutions was $4.5 million. Adjusted Net income attributable to Charah Solutions, which excludes $2.4 million of non-recurring and non-operating legal and transaction costs and related tax adjustments, was $5.4 million for the fourth quarter of 2018. Adjusted earnings per diluted share was $0.18. Adjusted EBITDA for the fourth quarter of 2018 was $22.9 million, an increase of $2.4 million, or 12%, from the fourth quarter 2017 level of $20.4 million. Revenue increased $310.1 million, or 72%, to $740.5 million from $430.4 million in 2017. Gross profit increased $13.6 million, or 16%, to $97.7 million from $84.2 million in 2017. Gross profit as a percentage of revenue, or gross margin, decreased to 13.2% from 19.6%, primarily due to the mix of projects and adverse weather impacts in the Company’s Environmental Solutions segment and, to a lesser degree, a full year of nuclear services offerings in the Maintenance and Technical Services segment. Environmental Solutions Segment: Environmental Solutions generated revenue of $343.1 million, an increase of $103.1 million, or 43%, from the year-ago period. The acquisition of SCB in March 2018 represented $45.8 million of the increase, with the remainder primarily attributable to the accelerated completion of the Brickhaven contract, partially offset by the roll-off of other remediation projects. Gross profit increased $3.6 million, or 5%, to $69.5 million from $65.8 million in the period a year ago, primarily reflecting the Brickhaven completion and the acquisition of SCB, partially offset by the roll-off of other remediation projects and adverse weather impacts. Gross margin declined to 20.2% from 27.4% in 2017 primarily due to a change in the mix of contracts, weather-related impacts and the acquisition of SCB, for which the base business carries lower margins than the new technologies being rolled out. Maintenance and Technical Services Segment: Maintenance and Technical Services generated revenue of $397.4 million, an increase of $207.0 million, or 109%, from the same quarter a year ago. Most of the revenue increase was attributable to the addition of the Company’s nuclear services offerings as a result of the startup of Allied in mid-2017. Gross profit increased $9.9 million, or 54%, to $28.3 million from $18.3 million in 2017, primarily due to having a full year of nuclear services offerings in 2018. Gross margin was 7.1%, down from 9.6% in 2017, primarily due to a full year of nuclear services offerings. 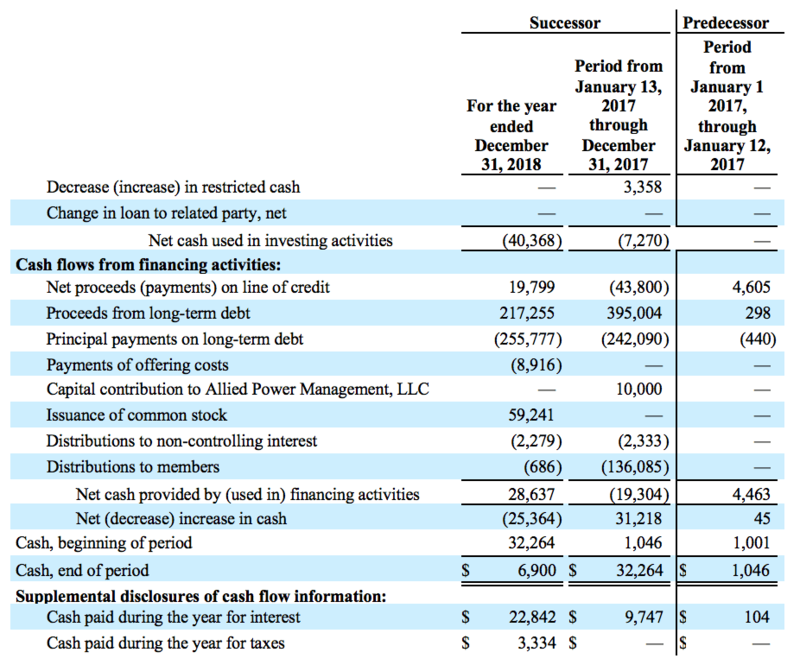 2018 results included a $20 million litigation reserve and $11.4 million of other non-operational and non-recurring charges (included in G&A expense) and $12.5 million of refinancing expenses (included in interest expense) in conjunction with the Company’s term loan refinancing in the third quarter of 2018. Net loss attributable to Charah Solutions for 2018 was $(8.9) million, a decrease of $21.7 million from net income of $12.8 million for 2017. The decrease was attributable to the increase in G&A expense resulting from the non-recurring charges and higher interest expense. 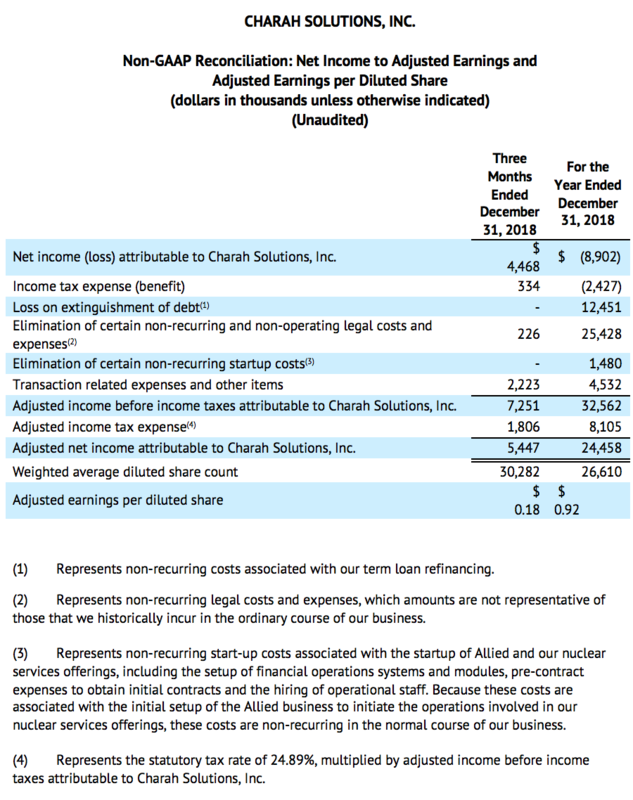 Adjusted Net income attributable to Charah Solutions, which excludes the $31.4 million pretax of non-recurring and non-operating legal costs, was $24.5 million for 2018. Adjusted earnings per diluted share was $0.92. Adjusted EBITDA for 2018 was $98.8 million, an increase of $22.8 million or 30% from the 2017 level of $76.0 million. The increase in Adjusted EBITDA occurred despite a reduction in net income because of depreciation and interest expense and non-recurring or transaction-related expenses, which were all higher than in 2017. Adjusted EBITDA margin was 13.3% versus 17.7% for 2017, with the decline attributable to lower gross margin. 2The dollar amount and percentage change information in this section reflects a comparison of full year 2018 results and the sum of the results for the period from January 1, 2017 through January 12, 2017 (Charah alone) and the period from January 13, 2017 through December 31, 2017 (Charah and Allied combined). CIE and operating cash flow. The accelerated completion of the Brickhaven contract significantly increased the Company’s working capital and reduced operating cash flow. Costs and estimated earnings in excess of billings (“CIE”) increased to $86.7 million at year end 2018 from $8.0 million at year end 2017. Nearly all of the CIE balance is associated with Brickhaven. 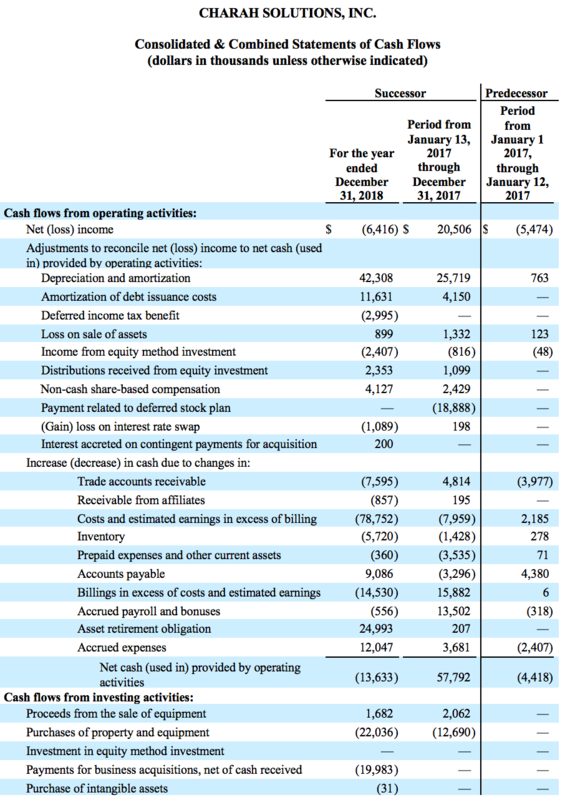 For the year, operating cash flow was $(13.6) million. The Company expects to substantially collect the CIE balance in 2019. The midpoint of 2019 revenue guidance is slightly lower than the 2018 level. Revenues in the Environmental Solutions segment are expected to be modestly lower in 2019 than 2018, due to the acceleration of Brickhaven revenues into 2018 and the timing of new business awards, partially offset by higher byproduct sales revenues. Revenues in the Maintenance and Technical Services segment are expected to be modestly higher in 2019 than 2018, with growth in fossil services offsetting a lower outage year in nuclear services. The Company expects revenue growth of at least 20% in 2020 from 2019 guidance, driven by its leading competitive position, favorable market dynamics and regulatory trends that continue to expand its opportunity set, and revenue and margin enhancement potential from the rollout of its technology initiatives. In addition, the Company expects improvement to its Adjusted EBITDA margin in 2020 relative to 2019 due to the higher-margin profile of the expected growth in revenues and the ability to grow revenues without materially scaling up G&A expense. Since the third quarter conference call, the Company has continued to roll out its proprietary technologies, with a focus on patented sustainable solutions that serve customers’ evolving needs while increasing the Company’s byproduct sales footprint and improving its competitive position. Both the MP618TM and slag grinding technologies have important competitive advantages versus other technologies, in that they are generally modular in design, relatively quick to market and can be scaled up or down to meet market demand. They also can be implemented at lower capital cost. The Company recently installed its MP618TM thermal fly ash beneficiation technology at its terminal in Sulphur, Louisiana, which is expected to improve the quality of fly ash and increase the supply of marketable fly ash to concrete producers in the region. Interest in this technology among potential utility customers has been strong. The Company recently opened its first slag grinding facility outside of Albany, New York. This facility uses the Company’s patented technologies for grinding granulated blast furnace slag from the steel industry to create supplementary cementitious materials (SCMs) that are sold to concrete product manufacturers throughout the Northeast. Because the technology is not dependent on a supply of fly ash, it can be located in those areas where there is demand from concrete producers but the supply of fly ash or other SCMs is limited. The Company recently commenced construction of two additional facilities, one in the Gulf Coast region and the other on the West Coast. Both are expected to be operational in the third quarter of this year. Since its third quarter 2018 conference call, the Company continued to grow its remediation and byproduct sales businesses while also diversifying the range of customers in its maintenance business by signing contracts with two utilities for fossil maintenance. In January, the Company began work under a new three-year contract with Arizona Public Service to perform maintenance, modification and outage services for all of the utility’s coal and gas plants in Arizona and New Mexico. Also in January, the Company signed a new three-year contract to perform maintenance and outage services for five Exelon fossil plants in Texas, Alabama and Georgia. These contract wins represent a diversification by the Company into servicing fossil plants and reflects the Company’s ability to market its maintenance, modification and outage capabilities to a broader mix of generation plants, technologies and regions. The Company also was awarded several remediation contacts with southeastern utilities, including one new customer; announced an ash marketing and management agreement with an American Electric Power plant in Oklahoma, and signed a new five-year ash management agreement with East Kentucky Power Cooperative. Charah Solutions will host a conference call at 8:30 a.m. ET today to discuss the fourth quarter results. Information contained within this press release will be referenced and should be considered in conjunction with the call. With 30 years of experience, Charah Solutions, Inc. is a leading provider of environmental and maintenance services to the power generation industry. Based in Louisville, Kentucky, Charah Solutions assists utilities with all aspects of managing, recycling and remediating ash byproducts generated from the combustion of coal in the production of electricity as well as routine power plant maintenance and outage services for coal and nuclear energy providers. The Company also designs and implements environmental solutions for ash pond management and closure, landfill construction, fly ash and slag sales, and structural fill projects. Charah Solutions is the partner of choice for solving customers’ most complex environmental challenges, and as an industry leader in quality, safety, and compliance, the company is committed to reducing greenhouse gas emissions for a cleaner energy future. For more information, please visit www.charah.com. Adjusted Net income (loss) and Adjusted earnings per diluted share are not financial measures determined in accordance with GAAP. Charah Solutions defines Adjusted Net income (loss) as Net income (loss) attributable to Charah Solutions plus, on a post-tax basis, certain legacy expenses, amounts from a non-acquired business line, write-off of debt issuance costs, prepayment penalties, non-recurring legal and start-up costs, transaction-related expenses and other items. Adjusted earnings per diluted share is based on Adjusted Net income (loss). Adjusted EBITDA and Adjusted EBITDA margin are not financial measures determined in accordance with GAAP. Charah Solutions defines Adjusted EBITDA as net income before interest expense, income taxes, depreciation and amortization, equity-based compensation, elimination of certain legacy expenses, amounts from a non-acquired business line, non-recurring legal and start-up costs, transaction-related expenses and other items. Adjusted EBITDA margin represents the ratio of Adjusted EBITDA to total revenues. Management believes Adjusted EBITDA and Adjusted EBITDA margin are useful performance measures because they allow for an effective evaluation of our operating performance when compared to our peers, without regard to our financing methods or capital structure. 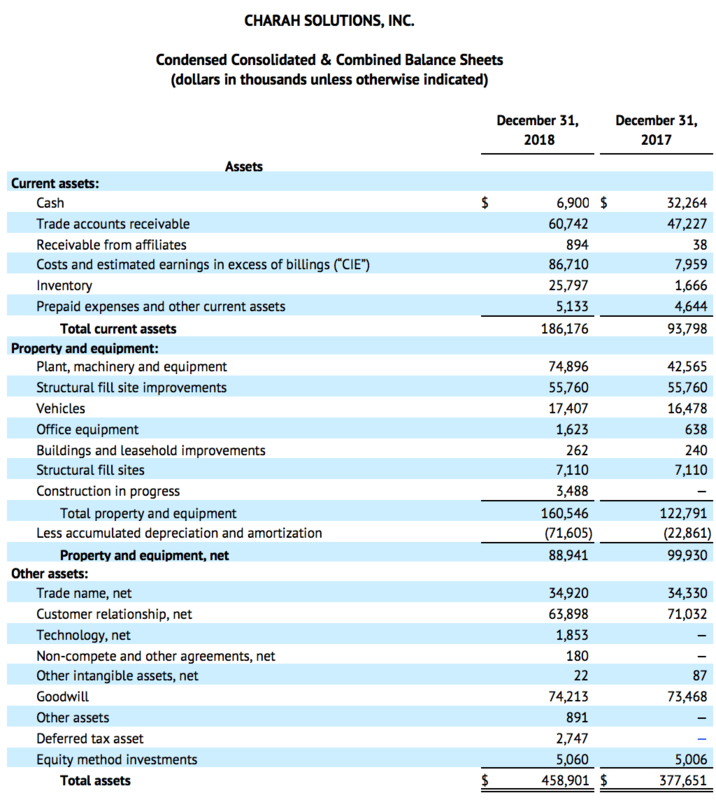 Management excludes the items listed above from net income in arriving at Adjusted EBITDA because these amounts are either non-recurring or can vary substantially within Charah Solutions’ industry depending upon accounting methods and book values of assets, capital structures and the method by which the assets were acquired. Adjusted EBITDA should not be considered as an alternative to, or more meaningful than, net income determined in accordance with GAAP. Certain items excluded from Adjusted EBITDA are significant components in understanding and assessing a company’s financial performance, such as a company’s cost of capital and tax structure, as well as the historic costs of depreciable assets, none of which are reflected in Adjusted EBITDA. Charah Solutions’ presentation of Adjusted EBITDA should not be construed as an indication that the Company’s results will be unaffected by the items excluded from Adjusted EBITDA. 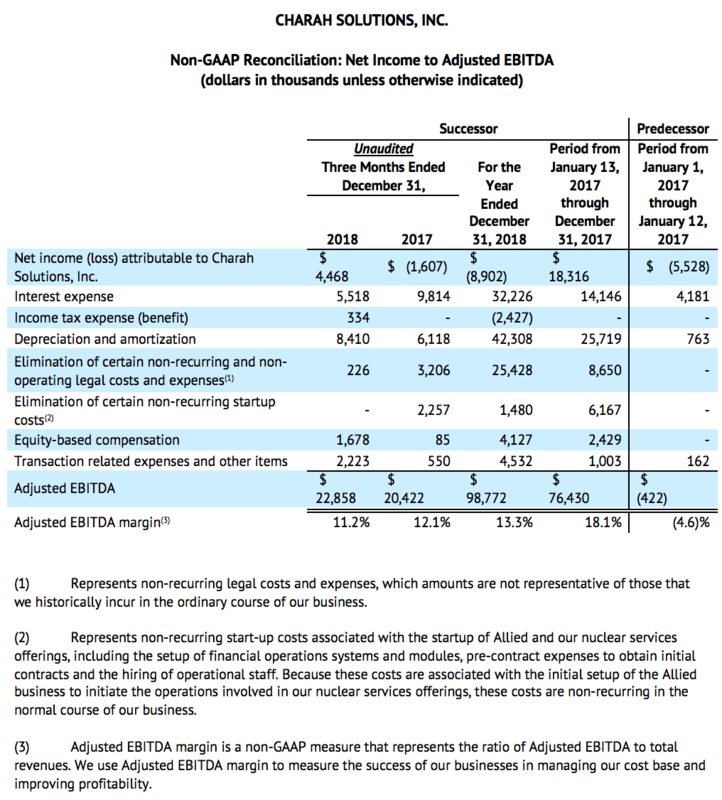 Charah Solutions’ computations of Adjusted EBITDA may not be identical to other similarly titled measures of other companies. Charah Solutions uses Adjusted EBITDA margin to measure the success for the Company’s business in managing its cost base and improving profitability. 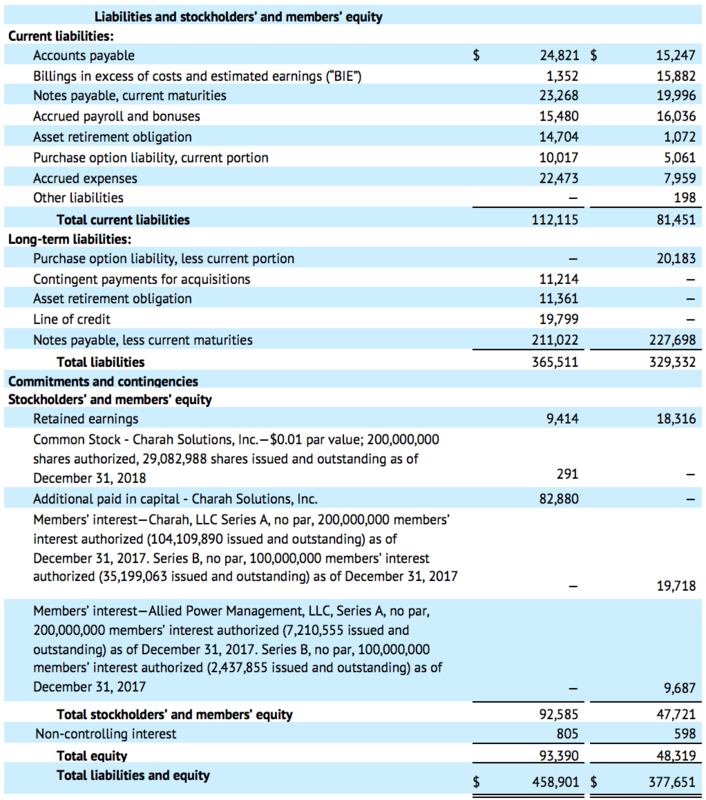 A reconciliation between Adjusted EBITDA to net income, Charah Solutions’ most directly comparable financial measure calculated and presented in accordance with GAAP, along with the Company’s Adjusted EBITDA margin is included in the supplemental financial data attached to this press release.